Play Rainbow Riches Drops of Gold Slot Online with 500 Free Spins! Rainbow Riches Drops of Gold is a very changeable online slot with anywhere from 50-200 paylines depending on your bet and the triggered features with a standard 94% up to 97.75% RTP if you choose the Big Bet Feature. Welcome to a beautiful, picturesque field, surrounded by trees, that is home to the end of the rainbow. And don’t they usually say that there is a crock of gold at the end of the rainbow? Well this game will help you to find out, with five rolling reels and up to 200 paylines. Roseslots.com, proudly presents, ‘Rainbow Riches: Drops of gold’ by game developers Barcrest, released in June 2018. 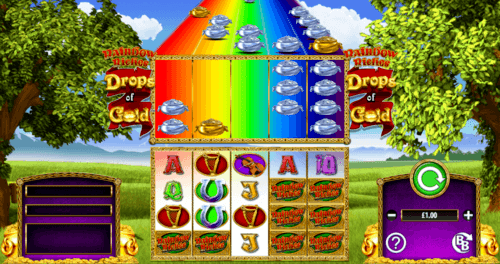 ‘Rainbow Riches: Drops of Gold’ in another online video slot series of Rainbow Riches games by Barcrest, which places us at the end of the rainbow, in a lovely, idyllic field, in amongst the trees, to try and catch a pot of gold. It is a well animated game that offers bets from as low as £0.10, to as high as £500, with a potential 1000 times your stake available for its jackpot, and with an RTP (return to player) rate of 94-97.75%, the bigger bets offering the bigger wins, you could well have a pot of gold dropped upon you. As with many online video slots, the game would like you to match symbols in accepted playlines, with the low value symbols being represented by the frequently used playing card symbols of a Ten, a Jack, a Queen, a King (which all pay up to 50 times your stake for five on a payline) and an Ace (rewarding 75 times for five). However, in preference, it is the higher value symbols that you will be better achieving, and they are represented by a Harp, a Fiddle, a toadstool, a horseshoe and the ‘Drops of Gold’ symbol, with the latter being the most valuable commodity. But the excellent thing about this game, before we even consider the bonus rounds, is the fact that you can see what is about to drop onto your reels on any spin as there is a ‘conveyer belt’, so to speak visible to you. Bonus features are where some serious money can be won in ‘Rainbow Riches: Drops of Gold’. There are two wild symbols, ‘the Pot of Silver’ and the ‘Pot of Gold’, as well as a bonus symbol which is a sack of coins. The ‘Pot of Silver’ will help you put together winning lines by replacing everything but the bonus symbol, and the pot of gold will activate a bonus, when appearing on reel five, by moving all of the ‘Pot’ symbols seen on the cascade into your playing reels to act as wilds. The bonus symbol will activate the ‘free spins’ bonus, when three of the sack of coin symbols arrive anywhere on the reels, you will be given eight, free spins, with an additional four spins awarded per additional bonus symbol (so twelve freespins for four bonus symbols, sixteen for five), and in addition to this, further free spins can be won whilst playing the free spins round. There is also a ‘Big Bet’ Feature which allows players to buy additional bets at times when they look odds on for a decent win, at a fixed price. So five free spins can be bought for £20 when the ‘Drops of Gold’ symbol is on five reels with plenty of pots on the conveyer, for £30 when the ‘Drops of Gold’ is on five reels, there are plenty of pots and all the low value symbols have gone. And for £50 when the above is true as well as there being 200 playlines in the base game. As I mention earlier, this game is one in an entire ‘Rainbow Riches’ series, so if you enjoyed this game, you could always try ‘Rainbow Riches online game’ ‘Rainbow Riches Free Spins’ or ‘Rainbow Riches Reels of Gold UK slot’ all by Barcrest. Barcrest returns to their most popular range of games for this Irish-themed online slot, featuring all the legends and folklore of the Emerald Isle. Play takes place on a 5x4 layout of reels and rows, with 200 paying lines available, and an RTP that can go as high as 97.5% depending on the size of stake you play with. There's an innovative ‘Drops of Gold' bonus feature, accompanied by free spins and a ‘double or nothing' gamble. The Rainbow Riches franchise is one of the most prized assets of any online slot developer in the world, and it belongs to Barcrest and SG Gaming. It's an absolutely legendary series of games, popular since the launch of the first game back in 2006, and continuously finding new ways to entertain and enthral players. Rainbow Riches Drops of Gold is just one of many games in the series, all of which have proven to be massively popular with players. If you’re new to the Rainbow Riches games, then you’re in for the treat. We’ll set the scene for you. Every game in the family is set in an ultra-colourful and picturesque version of Ireland, and packed full of all the typical symbols of Irish myth and legend. Prepare to see lucky leprechauns, fiddles and four-leafed clovers as you tap your feet along to the traditional Irish music that plays in the background. The way that the Drops of Gold entry in the series identifies itself as being different from the original is that it’s a much bigger game. The 5x4 layout is big enough to begin with, but above the standard reels is a colourful rainbow which is full of gold and silver pots. Getting that rainbow to open up and drop the pots down onto your reels is the key to success in the game, and we’ll talk about that when we review the bonus features. Behind the reels are the lush and verdant fields of Ireland as far as the eye can see, providing a tranquil landscape without distracting you from the important task of focusing on the game. Symbols on the reels in this game start with the tried-and-trusted playing cards 10, J, Q, K and A, which account for the lowest values. Above them are symbols which are tied into the theme of the game; a fiddle, a harp, mushrooms and the logo of the game itself. The graphics have been drawn in a friendly, bright and cartoonish way; that's always been part of the charm of Rainbow Riches, and helps to provide a fun and friendly atmosphere. It's always good to play slot games with a smile on your face, and the design of this game helps you to do just that. If you were counting, you'd have noticed that there aren't many basic symbols in this game, and that's because things get a little more intricate as we approach the bonus features. All of the wilds are actually trapped in the rainbow, represented by the gold and silver pots. You have to coax them out to win anything from them. When you do, you'll find that the silver pot substitutes for everything apart from the bonus to make winning combinations. The gold pot is even more powerful, even replacing the bonus. Representing the bonus is a symbol which combines several Irish stereotypes; it's a rainbow with a pot of gold at the end of it! To explain how the game works in more detail, we're going to have to take a closer look at the bonus features, so let's do that. Part of the reason that the Rainbow Riches series has been a sustained success is that Barcrest has always been able to find new ways to present the games; there's always a unique bonus feature, or a fresh take on the base game, making things new and exciting all over again with each release. The Drops of Gold bonus is what achieves that feat for this game. Releasing the wilds from the rainbow above the reels is the whole point of the Drops of Gold bonus. Any time the game’s logo turns up on reel five, every gold or silver pot that’s currently on the bottom row of the rainbow will drop down and replace the symbols in the corresponding position on the game’s reels. They’re wild, and so if several of them drop at the same time, you should be in for a good win. As well as that simple-but-effective bonus, Drops of Gold also offers free spins. You need to find three or more bonus symbols in any position on the reels to trigger the feature. Three bonus symbols gets you eight free spins, plus four more for any additional bonus symbols that appear at the same time. This feature can re-trigger if the bonus symbols keep on appearing. In theory, the free spins can go on forever. Many of the more recent Barcrest games contain a Big Bet feature, which is there to appeal to the high-rollers among you. In return for an increased stake of £20, the game expands the bonus symbol on the fifth reel so that it covers two rows, making it more likely to trigger. At the same time, the rainbow is packed full of more wilds, meaning that when you do trigger the bonus, you get more wilds on the reels, and therefore more wins. High risk, high reward! Push the stake up to £30, and all of the above will happen, but all of the lower value symbols are taken away from the reels. That means that if the bonus triggers, the wilds can only create winning lines from higher value symbols, and so the returns are greater. If you really want to go big, you can take a £50 Big Bet, which increases the number of paying lines to 100 if you're in the base game, or 200 if you have Free Spins in progress. That gives you the maximum chance of taking away a big win, but it comes at a price. With the Big Bet feature enabled, the game increases from its standard RTP of 96% to 97.5%. Barcrest is a great name from gaming's past. They opened for the first time in 1968; long before the days of personal computers, never mind the internet! They manufactured slot games of the physical kind, shipping them to not only casinos within the UK, but also abroad to mainland Europe. They were among the industry leaders of the time, with a customer book full of big-name bars and casinos, and their services were constantly in demand. When the age of the internet arrived, it changed everything for slot game manufacturers. Those who were capable of moving over to the new format did so. Those who weren't are now almost all out of business. Barcrest stayed on the crest of the wave, not only switching seamlessly to creating mobile slots but developing one of the best known of all time. The Rainbow Riches franchise is Barcrest's most famous creation, having first launched with the original game in 2006, and been followed up since with a number of wildly popular sequels and follow up games. These days though, it's not just Barcrest who get to share in the profits. Scientific Gaming had been making strides in the world of slot development for some time when they made an offer to buy Barcrest. The value of the Rainbow Riches series was already known at the time, but as more and more people opened up to the idea of playing slot games online or through their mobiles, that value was always likely to increase, and Scientific wanted to capitalise on it. In 2011 they bought Barcrest outright, also acquired another development company called The Global Draw, and became SG Gaming. The Barcrest brand name has been kept alive, but in reality, they're now an in-house developer for SG. Adding Barcrest's team and facilities to their own, along with their other acquisitions, SG Gaming has become a vast and powerful company. They have offices in desirable areas of both London and Manchester, and employ more than 500 people. Even though their primary focus is the production of slot games, they also manufacture physical slot games and other casino machinery, and ship it out to Europe; the exact same thing Barcrest were doing over half a century ago! The tone of the comment tells you everything about their confidence in the game. They can call the star of Rainbow Riches: Drops of Gold "everybody's favourite leprechaun" because they know that most slot game players already know all about the game. This sequel was released in 2018 and is already proving just as popular with players as the rest of the games have. Of course SG Gaming have a lot of games similar to this one; they have a whole series of them! We’ve mentioned the Rainbow Riches family of games a few times now, so we think it’s time we properly introduced you. Rainbow Riches: The game that spawned a legend. This cute, playful Irish folklore classic is every bit as bewitching today as it was in 2006. In a slot game world crammed full of Irish folklore themed slots, what makes this one so special? Is it the way it handles its subject matter with a nod and a wink? Is it the almost-overpowering sense of cheer and charm that comes with loading it? Maybe, but we think the main reason might be the bonus features. They're as advanced and enthralling as any bonus features on games released today, and in 2006 they were revolutionary. Many of the sequels to this game still use the ‘Road to Riches' bonus which appeared for the first time in the original Rainbow Riches. Twenty paylines may seem like the standard now, and the RTP of 95% may not excite everybody, but every slot game player should play Rainbow Riches at least once, and find out what all the fuss is about. Rainbow Riches Pick ‘n’ Mix: Ten years after the original Rainbow Riches, Barcrest finally released a sequel. It was worth waiting for. The title is appropriate; you can literally pick and mix your preferred bonus features in this game. There are five available, and you can choose any three of them to play for before you begin. If you change your mind about your choice, you can swap them in and out at any time you like! It's almost like a slot game you can build yourself. Among the bonuses for your consideration are a prize-picker round, free spins, a ‘Cash Crop' mode that functions a little like a scratchcard, and many more. The Big Bet feature that's in Drops of Gold also appears here and works similarly. RTP varies between 96-98% for the same reason. Rainbow Riches Reels of Gold: Pick ‘N Mix wasn't the only new addition to the Rainbow Riches family in 2016; Rainbow Riches Reels of Gold was released, too. Not everybody will be a fan of this game; it's a vast and challenging slot game with a lot to keep an eye on! The vast playing area is expanded out to ten reels split across two different sets of five rows, with 100 paying lines to aim for every time you spin. Add in the fact that there are a whole eight separate bonus features, and you really may start to worry about headaches. Some players; those who love modern games and are tired of the same old ‘spin the reels and hope for the wilds' format, will absolutely love this unconventional approach. Others will hate it. Even if you manage to stay on top of all those reels and features, sometimes a fairy will appear completely at random and change the symbols. If you think you can cope with this bold and ambitious slot game, it can offer you varied play like very few others, as well as an RTP of up to 98%. Rainbow Riches Free Spins: A year after releasing their first two Rainbow Riches series, Barcrest and SG came up with the third. This feels like it was almost intended as an answer to the Slots of Gold game; rather than loading up on new features, Free Spins takes most of them away and focuses on a single one; free spins (hence the name). The developer pushes the boat out on those free spins though; the round can re-trigger indefinitely, and there are great multiplier options available so you can make the feature very lucrative if luck is on your side. With only ten fixed paylines you could be forgiven for expecting a reduced level of payouts, but the game solves that problem by operating with fewer symbols than any other Rainbow Riches game. With fewer symbols come more regular wins. Rainbow Riches Fortune Favours: SG and Barcrest are currently releasing either one or two Rainbow Riches games every year, which tells you a lot about how popular they must be. Fortune Favours was a 2018 release. While the previous sequels all looked for a new take in order to differentiate themselves from what had gone on before, Fortune Favours feels more like revisiting the 2006 original, with fresh graphics and sounds painted onto the old game. There are a couple of more modern features included though; the fairy from Slots of Gold is back to bless your reels, and the ‘Big Bet' mode that's becoming an SG trademark is here too. If you want to play a ‘better looking' Rainbow Riches than the original, but don't like the format of the previous sequels, this might be a better bet for you. Rainbow Riches Home Sweet Home: Another 2018 Rainbow Riches game! This is still a newborn in online slot terms; it launched at the very end of the year and is still in its honeymoon period. This game goes big, but not quite as big as Slots of Gold did; it confines itself to one set of reels and rows, but makes them a big 5x5 layout with 100 paying lines to find. The game’s primary bonus feature is heavily borrowed from Drops of Gold, with wooden doors and leprechaun symbols substituting for the rainbow and golden pots, but if you can’t borrow from yourself then who can you borrow from? It manages to feel vast and entertaining without being as complicated as Slots of Gold, so it makes for a good compromise option. As the owners of the Rainbow Riches series, SG and Barcrest definitely sit in the driving seat of the Irish slot game genre, but they’re not the only developers in the car! Virtually every major developer has come up with at least one Irish title at some point, and there must be hundreds of them out there in the world. We have a few of the better ones here at roseslots.com, which we’ll detail for you now. Irish Luck: Because slot game developers apparently don't speak to each other or double check before releasing games, we sometimes get more than one game with the same name. That's the case with Irish Luck; a fairly common expression that's been used as the title for several different games. Eyecon makes the one we offer to Rose Slots players (and also provide as a comparison to Rainbow Riches). As you'd expect from an Eyecon game, it's a fun game to play with some entertaining bonus features and cute characters. It's not as good-looking as Rainbow Riches Drops of Gold, and certainly not as varied, but it's an excellent game regardless. Leprechaun Song: If Eyecon games are best known for being cute and quirky, Pragmatic Play games are known for being good looking and slick to play. Leprechaun Song is all that and more, and in our opinion is the strongest of the rivals to the Rainbow Riches crown. The soundtrack is immersive and well constructed, gameplay is smooth and elegant, and the bonus features that have been included are well thought out, and complement the base game without becoming a distraction. We honestly don't know whether we prefer Leprechaun Song to Rainbow Riches Drops of Gold or not. We're just happy that both of them are here to play, and we invite you to take them both for a spin and make up your own mind! Irish Eyes 2: While we actually have Irish Eyes and Irish Eyes 2 (both games from the developer NextGen) on the Rose Slots roster, the sequel is the more advanced and recent game, and so is the stronger one to bear comparison to a Rainbow Riches game. All the beauty of Ireland's rural scenery is represented on the reels here; including Ireland's women. There's no sign of Ireland's men being depicted in the same way, which doesn't seem fair! Free spins and a gamble feature are offered in Irish Eyes 2 to go along with the base game, which has a 95.04% RTP. This is more solid than it is spectacular. Because Rainbow Riches: Drops of Gold is a recent release having launched in 2018, we’re entitled to expect it to function very well on a mobile phone or hand-held device. Any game developed in recent times should be built with mobile slot players in mind. The format is only going to become more popular as time goes on, and we may soon see the day when more people play on phones than they do on computers. The issue that Drops of Gold comes up against is that it needs a large display area to keep all of the reels in view. The 5x4 layout of the basic reels is big on its own, but the rainbow full of wilds on top of it requires even more space. That means this game won't work at all if you try to play it with your phone held the right way up; there isn't enough room on the screen. It therefore forces you to play with your phone tilted to the side, and even then it feels a little cramped; the buttons overlap the reels and disappear after they're pressed, but they're still slightly in the way. It is possible to play Drops of Gold on your mobile device, but it isn't as easy as it is to play on a computer. The game has an unusual design, and it doesn't translate across to the alternative format well. We can't hold it against SG; they tried to do something different, and they made a great game. We imagine it's given them pause for thought about how they design games in future, though. Whenever there’s a new arrival in the Rainbow Riches family, it’s a big story within the industry press. All the major websites know that a lot of their readers love the games, and so they’re keen to serve them content they want to read. Here are a couple of the places we’ve found Drops of Gold mentioned recently. The website CasinoBeats, which reports on the latest happenings within the casino and online slot world, were very excited at the time Drops of Gold was released. They included within an article covering four separate new games coming from the developer but seemed to be impressed by the Rainbow Riches games more than any of the others, noting that it was already doing very well with retailers. Gamespace’s end of year review for 2018 was also full of praise for the game, observing that it had been shortlisted for annual awards and praising the ‘Drops of Gold' bonus feature. At the same time, they felt that not enough players had picked it up and started playing it because they were still so in love with the previous Rainbow Riches games.